Destiny USA Winter Fun Pass – Full Court Fun! Sponsored by Burdick Lexus, the 2019 Destiny USA Winter Fun Pass—is now available! 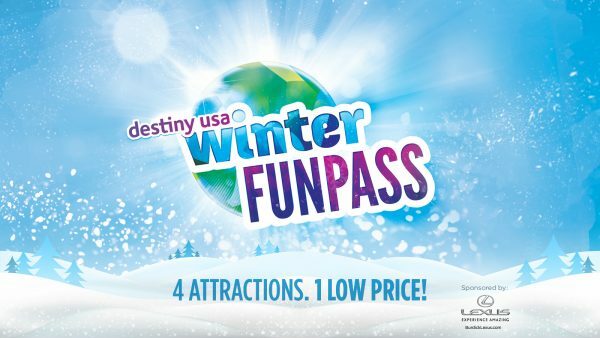 Enjoy excitement all winter long at any four of 28 participating venues at Destiny USA, plus FREE admission into one of seven 2019 Syracuse University men’s basketball games, one of three 2019 Syracuse University women’s basketball games, the Syracuse Crunch, the Milton J. Rubenstein Museum of Science & Technology (MOST) and the Rosamond Gifford Zoo—representing a savings of up to 65% per person. The Winter Fun Pass runs January 7, 2019 thru March 17, 2019, with No blackout dates this year! BUY NOW! 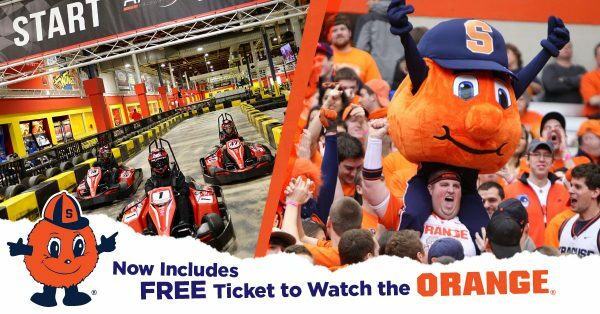 Destiny USA Winter Fun Passes includes FREE admission into one of seven upcoming 2019 home Syracuse Orange men’s basketball home games and one of three Syracuse Orange women’s basketball home games as an added bonus. 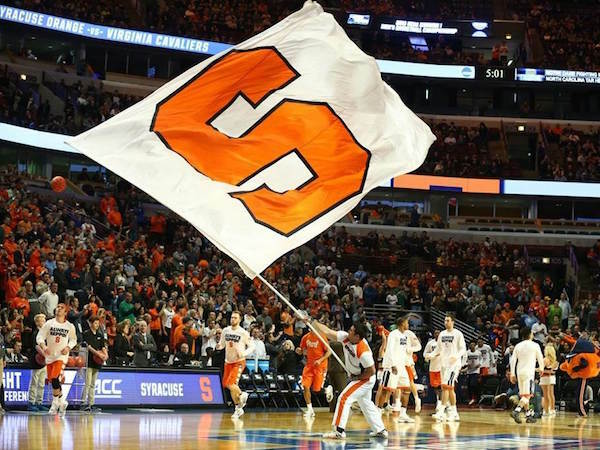 Beginning January 7, 2019, Syracuse Basketball admission, Winter Fun Pass tickets must be surrendered and exchanged in person at the Carrier Dome box office GATE B (900 Irving Avenue, Syracuse, NY 13244). They can be exchanged at any time during business hours (including for future games) Monday-Friday, 8:30 a.m. to 4:30 p.m., and two hours prior to tip-off on weekend game-day. Fun Pass tickets will be redeemable for a non-premium, 300 level ticket in the Carrier Dome and groups will be placed together, when possible. What’s different from last winter, you ask? First of all, there are NO BLACKOUT DATES this year!! Plus, two venues are NEW to the scene, including Auntie Anne’s as a dining option, a new entertainment option, Apex Entertainment (opening February 2019) and updated offers from pass favorites like 5Wits, Cinnabon, and more! With each Fun Pass purchase, you will receive a barcoded booklet with tickets to be used at four of 28 participating Destiny USA venues. 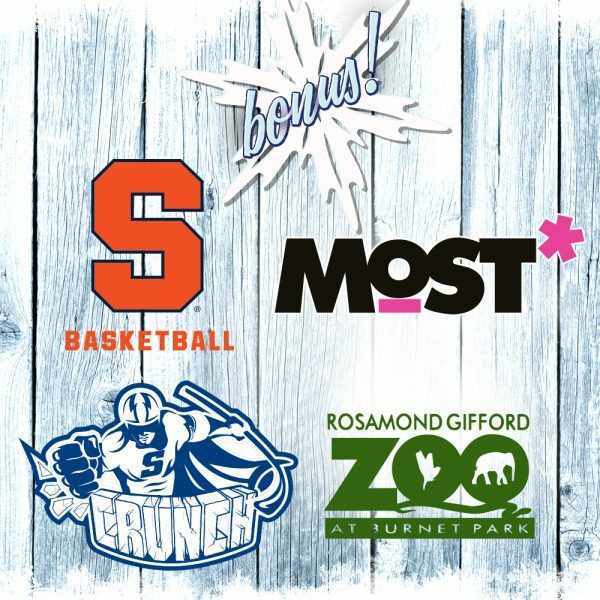 Each booklet also includes a bonus admission ticket to the Syracuse Crunch, Rosamond Gifford Zoo, Museum of Science and Technology (MOST) and a Syracuse University men’s and women’s basketball game. Restrictions apply and can be viewed online at www.destinyusa.com/winter. Child Fun Passes are available for $40 plus applicable sales tax (ages 12 and younger – age and weight restrictions apply at some venues) and Adult Fun Passes are available for $50 plus applicable sales tax. * 65% savings compared to purchasing individual venue passes and SU basketball ticket separately. (NEW) Auntie Anne’s: Classic Pretzel Combo – includes 1 classic pretzel, 1 dipping sauce, and 1 medium fountain soda only. Adults: Exclusive “Fun Pass” Pizza, or GB Chopped Salad, or “Destiny Burger” or CBLT. Adults: Original Burger, or Streamliner Burger, or Rocket Dog, Fries, and Soda. At $40 for a children’s pass and $50 for an Adult pass, the Winter Fun Pass offers a 65% savings compared to purchasing individual venue passes separately. Who doesn’t love 65% savings!? Some venues offer exclusive items that are only available with the Fun Pass, such as the “Destiny Burger” at Gordon Biersch. FREE ‘CUSE BASKETBALL! ‘Nuff said. Now that it’s back and better than ever, you can do your happy dance! Last Chance: Day Pass = Free Fair Admission!